This is one of the simplest, tastiest dishes and I always rely on it for a quick, light, healthy and impressive meal. 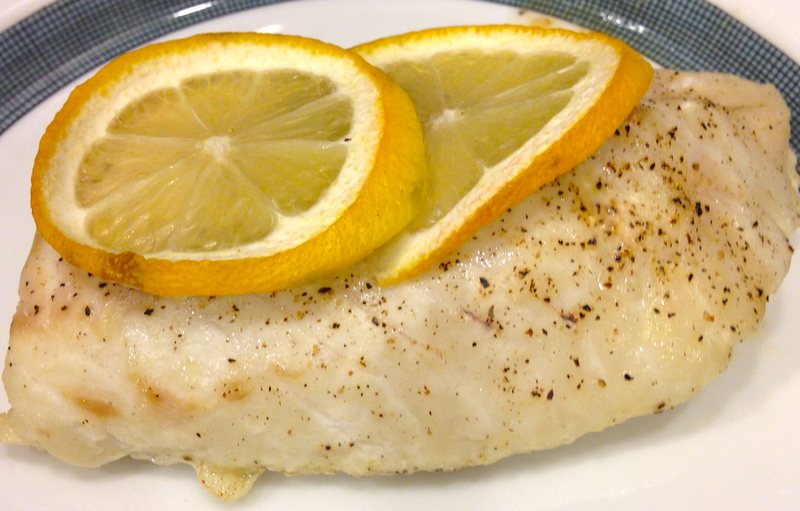 Paired with veggies and a grain, this simple cod dish fills you up without weighing you down! While low in calories and carbohydrates, this dish provides ample protein, healthy, monounsaturated fat and vitamin C. Craving a summer fish sandwich? Skip the fried stuff and add a whole grain bun with a thin layer of aioli to this fish fillet for a more substantial bite. 2. Spray casserole dish with nonstick vegetable oil cooking spray. Place fish fillets in casserole dish and drizzle olive oil over fish. Evenly distribute spices over fish. 3. Cut one lemon in half and remove any pits. Squeeze the juice from each half over fish fillets, allowing extra juice to puddle in the casserole dish. 4. Cut the remaining lemon into slices and remove any pits. 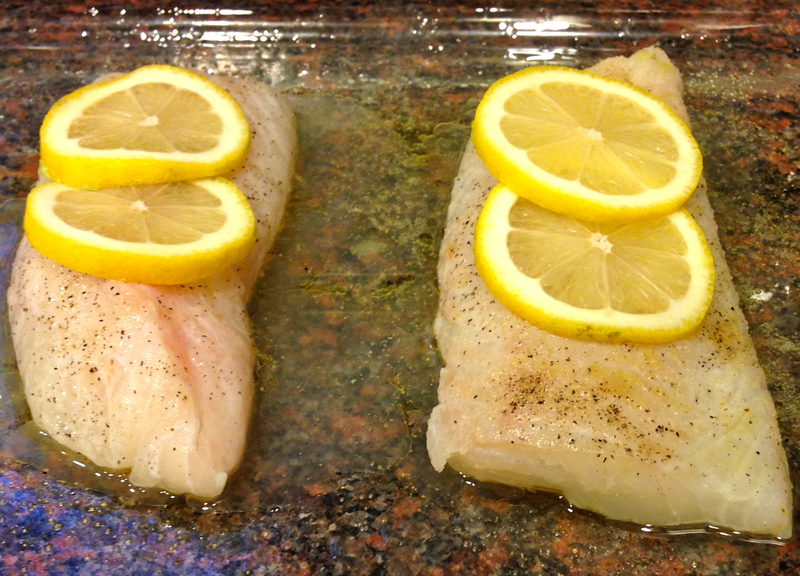 Place lemon slices over the fish. 5. Bake fish until cooked through (about 25-30 minutes). Fish should be white, flakey and reach an internal temperature of 145 degrees Fahrenheit. This homemade, chunky, vegetable sauce is a cinch to whip up and combines all the best flavors of summer. This sauce is loaded with beta-carotene, vitamin C and fiber, and skimps on fat and salt, so you can feel good about taking a few heaping spoonfuls. Use it as a topping for pasta, chicken, fish or toss with a whole grain (such as brown rice or quinoa) and enjoy a lower-sodium, fresher tasting sauce than store-bought varieties. 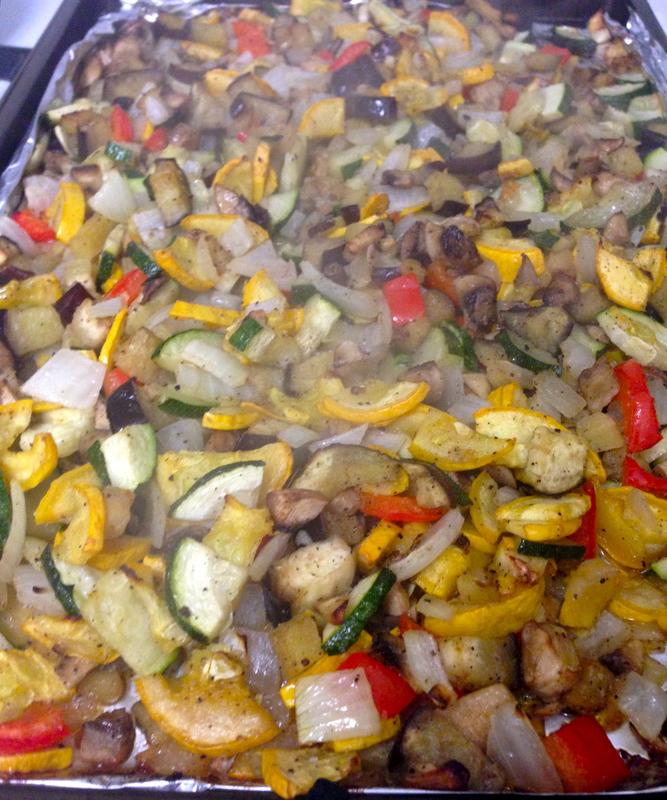 Roasted veggies – ready to mix into the sauce! 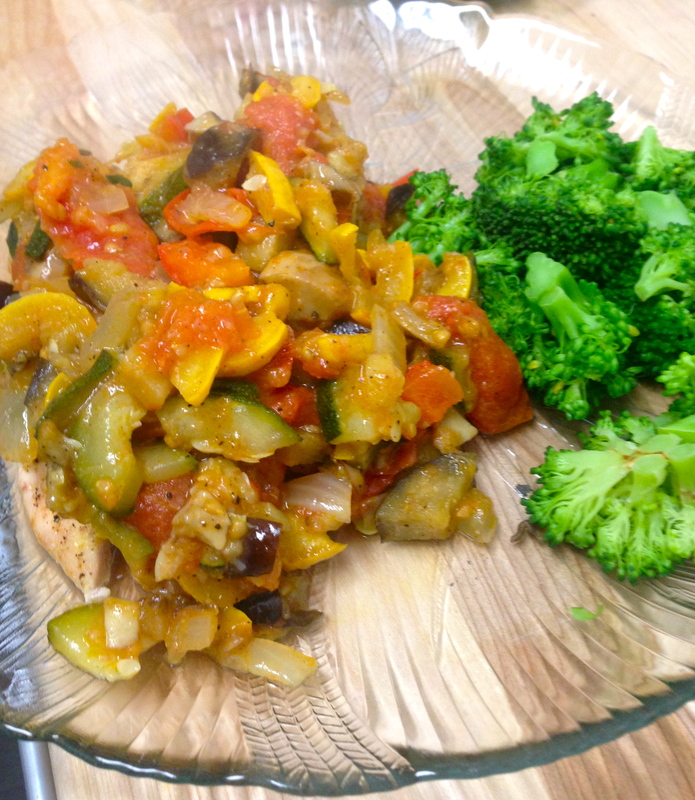 Sauce one way: I poured my sauce over chicken and served it with broccoli – yum! 3. 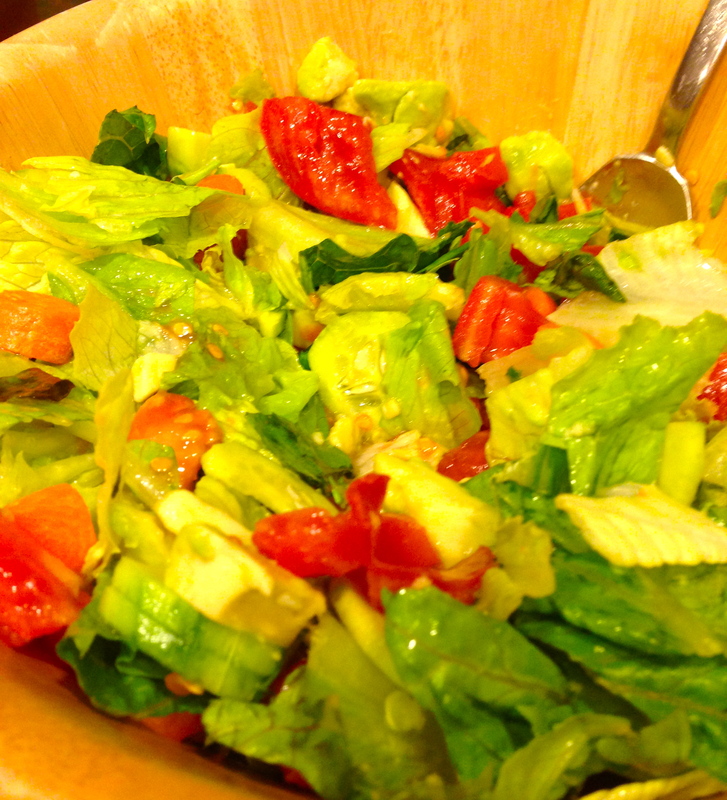 Drizzle 2 Tbsp olive oil over vegetables. Add spices. Combine well with hands and spread vegetables in a thin, even layer. Place baking sheet in oven and bake until vegetables are slightly browned and soft (about 20 minutes), mixing occasionally. 4. After vegetables have been baking for about 10 minutes, warm remaining 1 Tbsp olive oil in medium-sized saucepan over medium-high heat. Add tomatoes and cook for about 7-8 minutes, until chunky sauce forms. 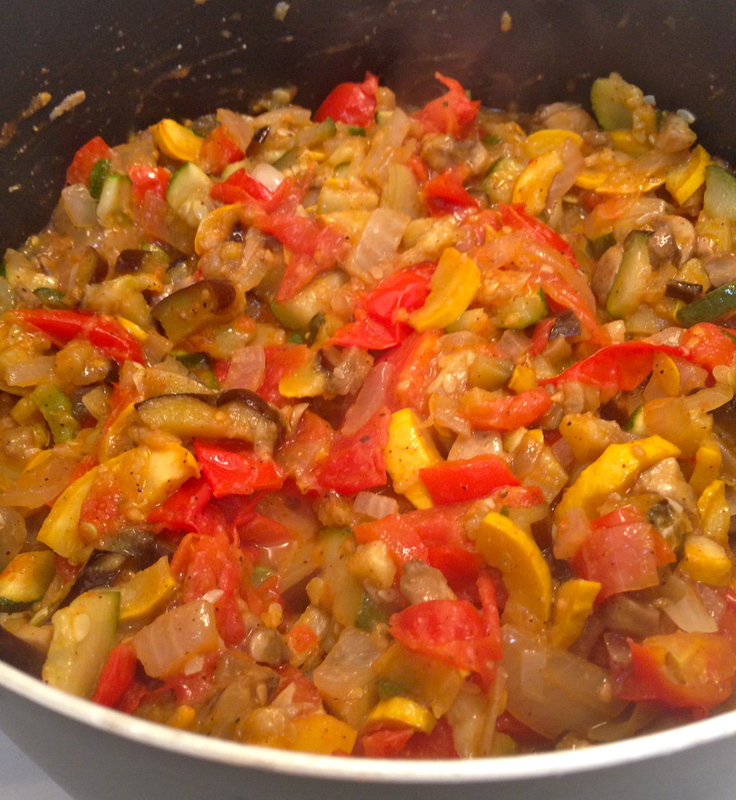 Reduce to low heat, cover and simmer until vegetables are in oven are cooked. 5. Add vegetables and basil to saucepan and stir. Cook another 10 minutes over low-medium heat. Serve over your favorite dish! 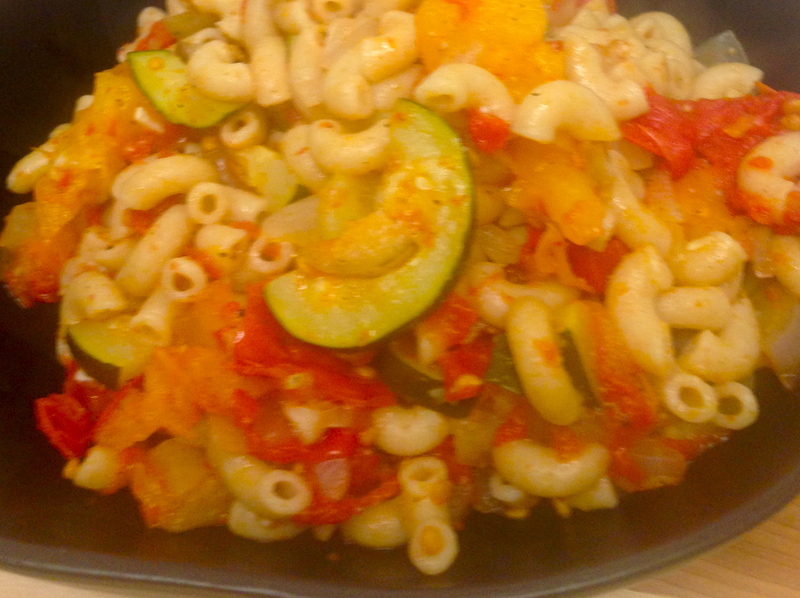 Sauce another way: I mixed it in with whole wheat pasta!